President Obama declared a major disaster in Oklahoma Tuesday and has ordered federal aid to supplement state and local funds. Emergency response teams are continuing to search in the rubble after the mile-wide twister destroyed homes and roads in Moore, Okla., outside of Oklahoma City. 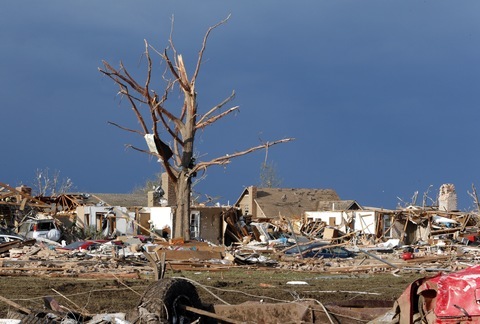 On Tuesday morning, the state medical examiner revised its death toll from the tornado to 24 people, including nine children. Authorities said initially that as many as 51 people were dead. Federal Emergency Management Agency director Craig Fugate is due in Oklahoma City Tuesday to ensure federal resources are deployed properly. According to Presidential Spokesperson Jay Carney, FEMA has adequate funds for recovery efforts, but did not rule out the possibility of additional request for money from congress. Homeland Security Secretary Janet Napolitano is scheduled to travel to the state Wednesday. The White House has not announced a presidential visit to the damaged areas, except to say that the president wants to make sure travel plans won’t interfere with recovering efforts. The National Weather Service announced Tuesday that the tornado was a top-of-the-scale EF-5 twister with winds of at least 200 mph. The Associated Press reported Tuesday that the agency upgraded the tornado from an EF-4 on the enhanced Fujita scale to an EF-5 based on what a damage assessment team saw on the ground. The tornado’s path was 17 miles long and 1.3 miles wide. Oklahoma Gov. Mary Fallin, city and county officials and emergency responders provide updates on the situation in Moore, Okla.
Thunderstorms and lightning slowed rescue efforts on Tuesday as National Guard members, firefighters from more than a dozen fire departments and rescuers from other states worked more than 100 survivors from the rubble of homes and schools, the AP reported. “The people of Moore should know that their country will remain on the ground, there for them, beside them, as long as it takes,” Obama said at the White House Tuesday. Seven of the nine children killed died at Plaza Tower Elementary School, which was hit directly. But according to Oklahoma State Police Sergeant Jeremy Lewis, there were also many successful rescue efforts. Miguel Macias and his wife Veronica had two children at Plaza Tower Elementary School during the tornado. Eight-year-old Ruby was rescued from the destruction and six-year-old Angel was later found at a local medical center with wounds to the face and head, but was not seriously hurt. Roxie M Albrecht, the director of Trauma and Surgical Critical Care at the Oklahoma University Medical Center said survivors suffered injuries ranging from minor cuts and bruises, to open wounds, impalements and open fractures. Oklahoma City Thunder star player Kevin Durant is donating $1 million to the American Red Cross for disaster relief after Monday’s tornado, matching a donation by the Thunder team. Durant has called Oklahoma City home for the last five years. He has grown to be a fixture in the community. He told the Associated Press that he will return home Wednesday and hopes to lift community spirits. The American Red Cross said they hope the gift from Durant will act as an incentive for potential donors. **PBS station OETA in Oklahoma has gathered this list of resources for helping victims of the storm**.